Home 7thCPC CEA DOPT ORDERS CEA Clarification by DoPT : CEA @ Rs.2250/- is fixed irrespective of the actual expenses incurred by the Govt. Servant. DoPT has issued an Office Memorandum on 9th May 2018 stating that Rs. 2250/- as Children Education Allowance is the fixed amount irrespective of the actual expenses incurred by the Government Servant. Subject: Clarification in respect of Children Education Allowance and Hostel Subsidy-reg. 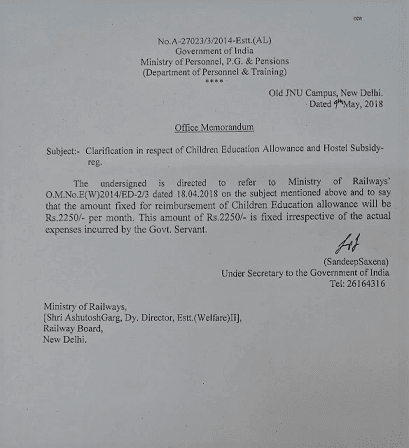 The undersigned is directed to refer to Ministry of Railways’ O.M.No.E(W)2014/ED-2/3 dated 18.04.2018 on the subject mentioned above and to say that the amount fixed for reimbursement of Children Education Allowance will be Rs.2250/- per month. This amount of Rs.2250/- is fixed irrespective of the actual expenses incurred by the Govt. Servant.